Recently, we had a client request that we generate bar codes to help them input specimens in a lab information system. Sounds like fun, huh? Below is the code we used for several of the formulas used to implement this in QuickBase. Salesforce supports similar use of HTML and URL coding, so with some tweaks you should be able to do similar there. "<a href=\"http://www.barcodesinc.com/generator/\"><img src=\"http://www.barcodesinc.com/generator/image.php?code="& [BarCodeID] &"&style=197&type=C128B&width=200&height=50&xres=1&font=3\" alt=\"the barcode printer: free barcode generator\" border=\"0\"></a>"
Building good documentation will take some time so let’s do it right the first time! Here are a few things to consider when building your system content. Keep it Simple! Start with business critical processes. The description field should be used to document the story or purpose behind every field. In some cases, this may seem redundant as the field label adequately describes the purpose, but for the sake of clarity, expand on the usage with the description field. Make it a habit to provide these details every time a new field is created or modified. For large organizations that leverage multiple record types, configurations and field values become difficult to manage, but a configuration workbook can help. *Click here for a customizable Excel based template of the configuration workbook. The concept of this document is to outline the specific business process, data standards and other important information that is specific to your business. If you haven’t heard yet, add-ons are now available for Google Docs and Sheets, extending the capabilities of Google Drive overall and increasing your productivity. All add-ons are currently free to try so reap the benefits of being an early adopter. We're fans of HelloFax because it's the easiest way for most of us to send the occasional fax. The Google Docs add-on makes that process even easier. Just click on HelloFax in your Add-Ons, enter the fax number you want to send the document to, and you're done. If faxing isn't your thing, the same company also has HelloSign for those times when you need to sign an important document in Google Docs. Creating bibliographies is one of the most tedious and boring parts of writing a paper in college, but EasyBib makes that process a bit better. Enter in a URL or title into EasyBib and it automatically generates a bibliography entry in MLA, APA, or Chicago style. If you're typing your research papers in Google Docs, this is incredibly helpful. Speaking of adding Word functionality to Google Docs, Table of Contents is also worth a look for anyone writing massive research papers. UberConference adds audio conference calls to your Google Doc. All you do is load up UberConference, invite your participants, and then everyone will be in the document and on the conference call within seconds. It works surprisingly well, and setup is simple since you don't ever need to leave Google Docs to use UberConference. Tracking changes is one of Microsoft Word's best tools and it was always a bummer that it didn't work the same way in Google Docs. Track Changes is an add-on that makes Google Docs work basically the same way as MS Word. Keep in mind, add-ons pull data similarly to apps and extensions. If what you’re looking for doesn’t exist, you can easily create your own add-on with a little bit of HTML knowledge. The maximum amount of data that an individual user can sync in their Salesforce Files folder is 5 GB. If the Salesforce Files folder reaches this limit, new files won’t sync until other files are removed from the folder. Support folks can now perform – Edit user details, Password reset, and assigning Permission sets, activate / deactivate / unlock users. It can be connected to Production and Sandbox too! Orders is now Standard objects, it looks like comes with Order products and option to connect with Contracts and Accounts. Further Price book also integrated with Orders. It seems very tight integration one order can have only one Price book and if price books selected it cannot be modified. Flow trigger workflow actions and trigger-ready flows are currently available through a pilot program. With flow triggers, you can automate complex business processes—create flows to perform logic, and have events trigger the flows via workflow rules—without writing code. For example, suppose you have a flow that looks up and assigns the relevant entitlement for a case. Grant users access to all cases related to their account or contact record. Grant users access to all cases related to a parent account or contact that is identified on the user’s account or contact record. Allocate quotas for various API limits to individual connected apps. App quotas for API limits enable you to reserve API capacity for mission-critical connected apps or set a ceiling for API usage of non-critical connected apps. A Partial Data sandbox is a Developer sandbox plus the data you define in a sandbox template. It includes the reports, dashboards, price books, products, apps, and customizations under Setup (including all of your metadata). Additionally, as defined by your sandbox template, Partial Data sandboxes can include your organization's standard and custom object records, documents, and attachments up to 5 GB of data and a maximum of 10,000 records per selected object. You can refresh a Partial Data sandbox every 5 days. Ted Wang (of Fenwick & West) launched Series Seed four years ago to provide templated documents to help entrepreneurs with seed-stage deals. The crowd-sourced set of documents is used by venture capital firms such as Andreessen Horowitz, Kleiner Perkins and Sequoia Capital for their own investments. Up until now, various smart people have talked or blogged about reducing the transaction costs associated with seed stage investment without rallying around a particular attack. Of course both entrepreneurs and investors would rather see their investment dollars used toward developing a new product and bringing it to market than toward what are usually routine transaction costs. The problem has been crafting a set of documents that provide adequate protections without being unduly burdensome. While traditional financing documents give broader rights and protections to investors, for a seed stage investment the benefits of simplification in the Series Seed documents outweigh the value of these additional rights and protections. Released in late February, version 3.2 (download here) is the most up-to-date and contains the most crowd-sourced input. Most people still believe that the best way to manage their money is to either pick stocks themselves or pay for trusted advice from investment advisers, brokers, or mutual fund managers so that they can "beat the market." But for years, sophisticated families and elite institutions have achieved superior returns with a very different method of investing that was developed by Economics and Finance Nobel Laureates. Their secret involves implementing a sophisticated asset allocation strategy with a globally diversified portfolio, keeping investment costs low and rebalancing their portfolios as markets ebb and flow. Because they don't pick stocks and they don't try to time the market, they have less stress than active traders. They are investing, not gambling. With MarketRiders you too can, implement these strategies for your Core portfolio. Want to play a hunch or capitalize on an insight you might have on a market trend? 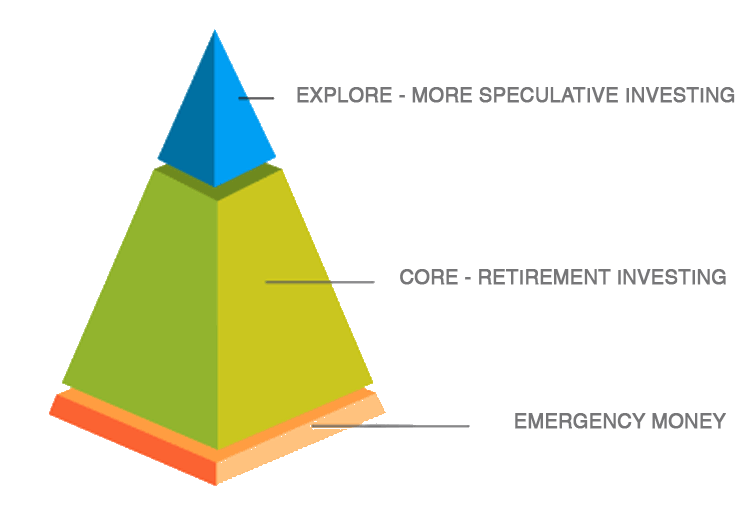 Make those investments in what experts call your "Explore" portfolio. But by managing your Core portfolio with MarketRiders, you will rest assured that you are doing right for you and your family by standing on the shoulders of some of the best investment minds in the world. Get started with MarketRiders by taking their tour which begins with a short questionnaire to help determine the right portfolio for you. Being a SaaS consultant for over a decade, I often come across the same situation over and over, again. For this reason, I try to save pieces of content like formulas or snippets of code, whenever I can. Sometimes I call them knowledge nuggets (my Google tag for them), but on this BLOG I will tag them as simplecode, because I am seeking the easiest and simplest implementations to highlight. ButtonClickAdmin - search for "decoding"
The use of email has become an everyday necessity bordering on slightly obsessive. We have all fallen prey to an overwhelmingly full inbox which has an adverse effect on our productivity. Even years later, we still find Inbox Zero from Merlin Mann a favorite for helping folks manage their inboxes. We continue to strive for zero everyday. Take a look at our guide to selecting web-based software with consideration to your organization’s needs, vendor selection tips and organization adoption “best practices”. Here’s an article from Michael Iachini, Managing Director of ETF Research of Charles Schwab, on how to tell if an all-index ETF portfolio is for you. The advantage of this portfolio is the ability to get almost exactly the exposure you want to each narrow piece of the market while still enjoying the diversification that ETFs offer over individual stocks and bonds. With any investment, we recommend due diligence before taking any major steps. How Many Communities Do I Get? Taking a quick scan of the Salesforce blogging space there are plenty of posts that tell you how to create a workflow. But very few, if any that tell you how to tease out the requirements from your domain expert(s). Salesforce MVP Mike Gerholdt instead walks you through his process for developing the right questions and thus, the technical requirements needed to build a Salesforce workflow. He guides you through the set-up options, coaches you on how to work with your "organizational crazies" and provides good advice along the way. Can We Do This A Better Way? Prezi - A PowerPoint Replacement? Tell us your thoughts. Are you a Prezi convert or will you be sticking to the old standby Powerpoint? A few years back, I worked with a young, decentralized startup (with people in many places as well as different countries). During that time, we had a simple but important marketing exercise that I strongly felt should have a process for resolving. I told them the process would not happen quickly or go well unless they assigned a driver (for the task), had this person do the first round, and then have him come back with 10 choices. Assuming the choices are well-received by you, the next step was to obtain the team’s feedback on the top 5 choices and ultimately, proceed to making the final call alongside 1-2 other trusted minds. Even on things as benign as simple marketing tactics, you want to show strong leadership and a plan. Groupthink tends to spiral, resulting in unnecessary time getting spent by too many on too little. As food for thought, this principle applies to many things in a decentralized (and centralized) startup environment. Don't outsmart yourself. Keep your corporate structure simple and use service pros (lawyers, accountants, bankers) who always do high-tech startup work. Uncle Joe, the divorce lawyer, might be cheaper, but you'll regret using him. Don't be paranoid. If you're concerned about a competing investment, explain the basics of your company and ask potential investors if there is going to be any overlap. Corollary: Take money from people you like. You're going to be working together for a long time, so ``chemistry'' counts. Be brief. These are the metrics: one-page introductory e-mail (no attachments); 20-page business plan; 12-slide PowerPoint presentation; and 40-minute presentation plus 20 minutes for discussion. Acknowledge the competition. If you tell potential investors that you have no competition, they will conclude one of two things: There's no market or you're clueless. Both are not conducive to getting funded. Look for value, not valuation. All money is not created equal. Take money from investors who ``get it'' and have relevant experience and connections. Eat when served. This is the wisdom of Eugene Kleiner (Kleiner Perkins Caufield & Byers). When people want to give you money, take it. Lots of things can happen between now and the next time you need to raise money. Keep "burn rates'' low and cash balances high. Keep enough capital on hand to last a year so that you can change your business model. Watch, don't buy, Super Bowl ads. Ask for ``less'' than you need. If there is anything investors hate more than bad deals, it's being locked out of good deals. Ask for less than you need so that you can declare victory as soon as possible. Then, graciously ``let'' others get in the deal. Let a thousand flowers bloom. Sometimes the most ``logical'' investors won't bite. On the other hand, investors in unrelated fields might. Don't be proud: Take the money. Don't let the bozos grind you down. Some of the most successful entrepreneurs couldn't raise money for months. The founders of Cisco are one example. Frankly, if you give up, you aren't an entrepreneur. Weird Idea #1. Hire slow learners of the organizational code. Specifically, hire people with a special kind of stupidity or stubbornness -- who avoid, ignore, or reject how things are "supposed to be done around here." Surround those slow learners with fast learners who understand how to promote their creative ideas. Weird Idea #1 1/2. Hire people who make you uncomfortable -- even those whom you dislike. Once you've hired people who prompt discomfort, take extra care to listen to their ideas. Weird Idea #2. Hire people whom you (probably) don't need. Interview and occasionally hire interesting or strange people with skills that your company doesn't need at the moment -- and might never need. Then ask them how they can help you. You might be surprised. Weird Idea #3. Use job interviews to get new ideas, not just to screen candidates. Job interviews are a weak way to select employees. Still, there is a little-known benefit: They provide the opportunity to learn something new. Give job candidates problems that you can't solve. Listen as much as you can. Talk as little as you can. Weird Idea #4. Encourage people to ignore superiors and peers. Hire defiant outsiders. Rather than teaching newcomers about company history or procedure, have the newcomers teach the old-timers how to think and act. Encourage people to drive you crazy by doing what they think is right rather than what they are told. Weird Idea #5. Find happy people, and let them fight. If you want innovation, you need upbeat people who know the right way to battle. Avoid conflict during the earliest stages of the creative process, but encourage people to fight over ideas in the intermediate stages. Top 10 Free Web Apps That I Can't Do Without!!! IFTTT.com is a fabulous automation tool that you don't need to be a programmer to use. You can build drop-dead, simple macros to do things like: copy attachments from your GMails and save them in a specific folder in your DropBox -- "awesome"
Evernote is a great note-taking app that syncs across all platforms (web, computer, mobile, & tablet). Dropbox is a ubiquitous file sharing solution that works everywhere, with everything. Blogger is just one of the many blog platforms available if you were thinking about getting into that. But you can also host pages connected to your BLOG. Quickbase is a highly-flexible, web-based data sharing solution. It's like sharing a spreadsheet over the web on steroids -- in actuality, it's a relational database that supports uploading from Excel. You’ve probably heard the adage “what got you here won’t get you there” as it applies to career success. The same wisdom also applies to a growing business. In the early stage, you may get along well enough using familiar tools like Post-it notes or Excel to track your customers and incoming orders. However, as your business grows, so does its complexity. You’ll quickly discover that you need more scalable ways to track your customers and transactions to stay competitive. 1. Your team does not have a single source of truth. 2. Lack of visibility into your sales teams’ activities. 3. Reporting and analysis is time-consuming and painful. 4. You are losing data. 5. You are not staying in touch while on the go. 6. You treat every customer the same. 7. You don’t have a plan to scale fast.